Hot weather, school supply lists, new school clothes…. a new school year is beginning. 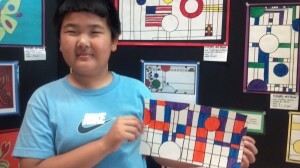 Help bring art to your child’s classroom this year. Look for the notice coming home with your children or in your school newsletter. Sign up to volunteer and mark your calendar for this important meeting, where we will be setting the workshop schedules for the year. If your school’s date is not listed below, check back again soon. It’s a new school year and a new school has joined our Art Corps family! Thanks to all the hard work put in by Shelley Rahim, Florence Malmgren and Dana Grue, The Turtleback Terrapins will be enjoying creating art all year long. The Orientation for all Art Corps volunteers will be held September 16 at 1:00. Wow! A new crop of Art shows are upon us. 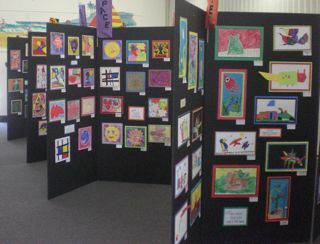 Don’t miss seeing the wonderful art that your children have been creating all year long. They are so proud to show it off. Here is the schedule of shows at our schools. We would like to welcome our newest school to the Art Corps family. Elevate Elementary is located in Serra Mesa and is a charter school within SDUSD. Principal Ryan Elliott and his assistant Valerie Kurtz have been working very hard since last year to bring Art Corps to Elevate. Amy in the office has ordered all the supplies. We will have our Orientation meeting on Friday, September 25 to kick off this year and training workshops will start soon after. A big thanks to Rose Leingang and her team for stepping up to coordinate the program and all their work getting everyone and everything in place and ready to go. Get ready to start creating art with your children! Workshop dates are being set and posted. Keep in mind the new workshop schedule for 2015 will be posted after the orientation has taken place at your school. To find your school and check the schedule, just click on your school’s name in the list on the righthand side of the homepage and the schedule will pop up. If you do plan to attend a workshop at another school, please contact that workshop leader ahead of time. Art Corps’ Annual brunch meeting will be held at Kathy Peterson’s house on Friday, August 21st from 10:00 to 12:00. We will share delicious brunch fare while we catch up with old friends and meet new faces. Important dates will be set for the year and helpful information will be provided to Supply Coordinators in a special break out meeting. If you did not receive your invitation or have questions, please call your Art Corps Director. See you all there! On May 9th two Oakdale schools put on school-wide art shows. 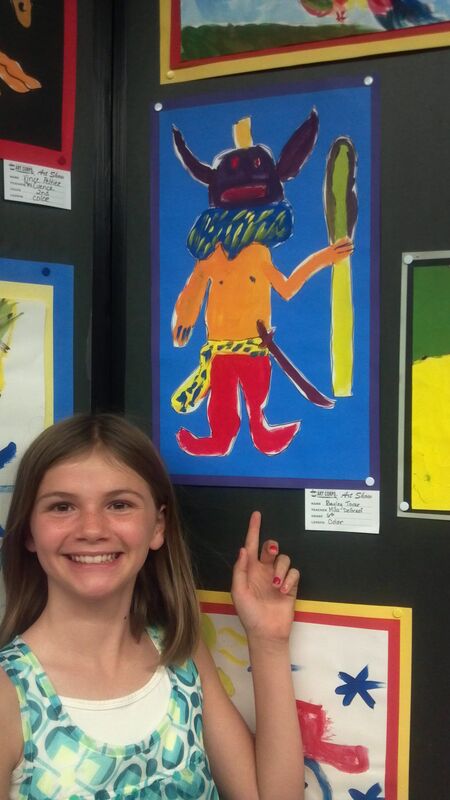 Cloverland Elementary held their 9th annual Art Show and Fair Oaks Elementary held their 1st annual Art Show. 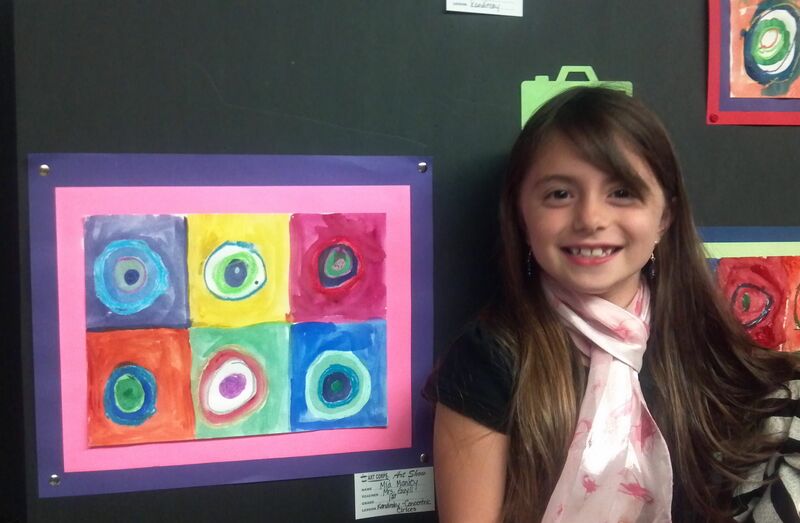 Every student had a piece of art displayed. Here are a few proud students with their artwork. Congratulations to all! Come see the fabulous art your students have created at your school’s annual school-wide Art Show! 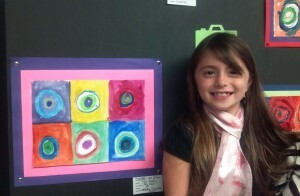 The students are very proud to show their artwork off to friends and family. A BIG, BIG THANK YOU to all the volunteers who helped bring the joyful experience of creating art to your school’s children. We would like to welcome our newest school to the Art Corps family. Fair Oaks Elementary is located in Oakdale, CA and joins our other school in Oakdale, Cloverland Elementary. Teacher Michelle Jones and parents Eileen Van Dyke, Jo Harris and Diann Domm have been working very hard since last year to bring Art Corps to Fair Oaks. We will have our Orientation meeting on Thursday, September 6 to kick off this year and training workshops will start the following day. A big thanks to Ashley Avila and Katie Healy and their team for stepping up to coordinate the program and all their work getting everything in place and ready to go.